Pemphigus is a group of rare autoimmune bullous diseases characterized by widespread blistering and erosions of the skin and mucous membranes. It is a chronic and potentially life-threatening condition. The worldwide incidence is 1-16 new cases per million people/year, while the European incidence is about 0.08 per 10,000 inhabits/year. All ages can be affected by pemphigus, though it is most commonly diagnosed in middle age. Pemphigus is a very serious chronic and potentially lethal disease. Our research on pemphigus pathomechanisms has allowed to identify the crucial molecule able to induce both cell death (apoptosis) and cell-cell detachment (acantholysis), events responsible for the blister formation. Human antibody, PC111, appears to be a decisive therapy for the resolution of this serious disease and a crucial alternative to the use of long-term treatment with corticosteroids and other immunosuppressive drugs, thus avoiding the severe side effects related to immunosuppression. Melanoma is the most aggressive form of skin cancer. Melanoma is derived from the transformation and proliferation of melanocytes that normally reside in the basal cell layer of the epidermis and synthesize skin pigment. Malignant melanoma, although less prevalent than non-melanoma skin cancers, is the major cause of death from skin cancer. Although early melanoma can be successfully cured with surgical excision, advanced and metastatic melanomas are generally fatal. Several drugs acting on cancer cells are used for melanoma, although with poor efficacy. In particular, systemic chemotherapy treatment for melanoma has demonstrated no significant activity because of the high chemoresistance melanoma cells are endowed of. The drug developed for melanoma (PC112) by PinCell is potentially able to overcome melanoma chemoresistance by selectively binding a malignant cell surface receptor, and activating apoptosis. Psoriasis is a chronic skin disease that can have profound consequences on self-perception, on social relationships and on quality of life of the affected individuals. The defect underlying psoriasis affects the whole body surface and psoriatic arthritis are often associated. Thus, psoriasis is more than just a skin disease, as it interferes with normal everyday activities. Many studies compare psoriasis with other major diseases, such as depression, diabetes and cardiovascular diseases, in terms of impact on quality of life. The incidence (new cases/100,00 individuals/year) is assessed around 79-230/100,000/year. 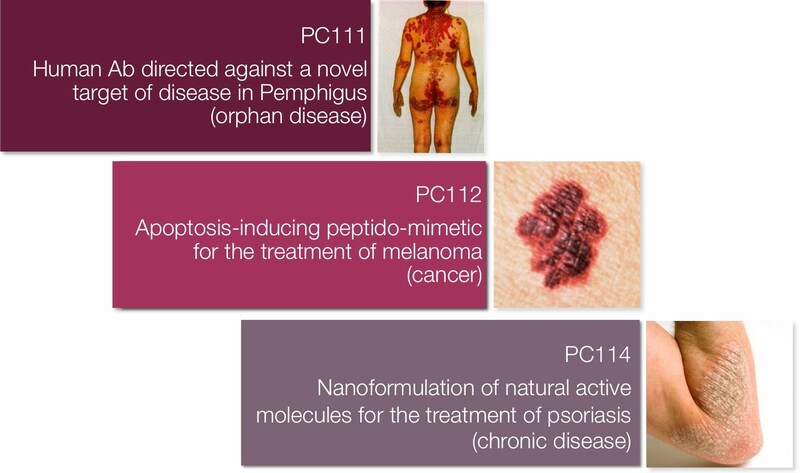 The drug under investigation (PC114) is a nanoformulation of natural molecules able to target inflammation at the skin level.